Arlene Ruth Enger, age 90 of Big Lake, passed away at North Memorial Hospital on January 16, 2019, surrounded by her loving family. Arlene was born on August 15, 1928 to Ludwig and Laurenze Larson at the family home in Orrock. She lived most of her life in Big Lake until the last 8 years when she resided at Diamond Crest Senior living in Rogers. She married Allen Enger on August 22, 1953 and together they raised a family of four children and were blessed with six grandchildren and six great grandchildren. 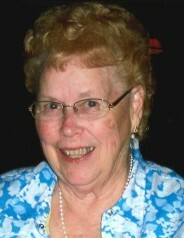 Together with her family, she helped run a farm and Enger’s Campground on the shores of Big Eagle Lake for 18 years. Besides working a farm and running a family resort, she never turned down a request for help from her church or community. She mastered every craft she tried, made the best apple pie in the county, fried Sunfish to crispy perfection, and she could magically diaper a baby with one hand. Her Christmas morning popovers were an annual delight to her family! Arlene is preceded in death by her husband, Allen of 53 years. She is survived by her children, Terry (Debbie), Laurie Wokson (Larry), Mel (Debbi) and Wayne; grandchildren, Josh (Katie), Jake, Jenna (Justin) Wild, Ben (Taylor), Travis and Jereme DuPaul; and 6 great grandchildren. A celebration of life will be held at 2PM with visitation one hour prior on Saturday, February 2nd, at Lord of Life Lutheran Church, 7401 County Road 101, Maple Grove. Memorials preferred to Orrock Cemetery or Hope Lutheran Church in Big Lake.